San Francisco's quartet Stroke 9 is a hit or miss band. This radio-friendly ready band can crank out catchy, sugar-coated modern rock nuggets and sit them next to some run-of-the-mill rock numbers which, under other circumstances, may stand a chance had the album not contained the high points it does. But, hooking you with such shiny numbers like they do, the lesser songs seem to get swept under the carpet because they just can't compete. 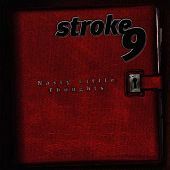 I haven't heard a modern rock band in ages, who I had never heard of previously, who can crank out such shiners like Stroke 9. Matter of fact, the band blew me away; I caught myself singing to a few of these songs which is nearly impossible to do with the modern rock garbage that is being shoved down kids' throats these days. "Letters," "City Life," "Washin' + Wonderin'," and the highly infectious, first song, and song that got them signed, "Little Black Backpack," all sent a rush of sugar through my body, instantly hooked me, and got me singing along to every word (and reading the booklet for the words I didn't pick up at first). Though the album isn't hit after hit, its roller coaster ride from hit to mediocre is nice, especially when you're on the hit songs. Take my word for it, if the label can promote and push songs like "Letters" and "Little Black Backpack" to modern rock radio and MTV, they'll have a platinum record on their hands in no time. I'll give it a B.